Abigail Williams was one of the first afflicted girls in the Salem Witch Trials. 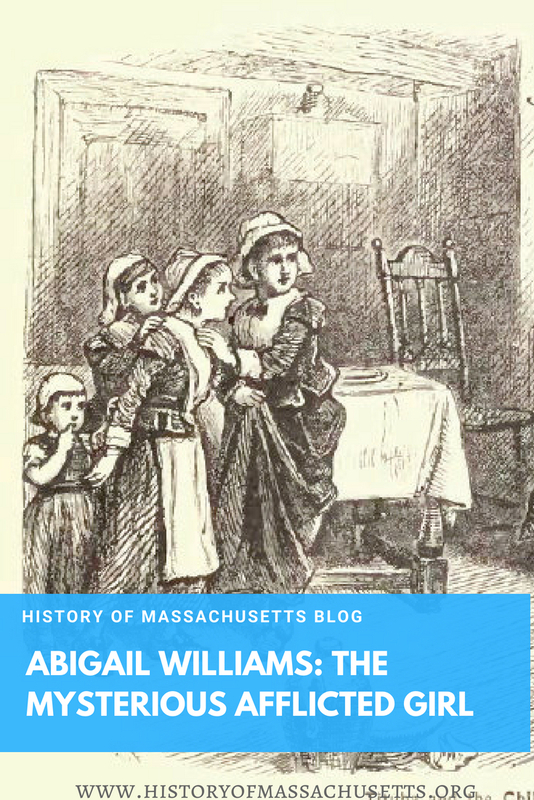 Despite the fact that she was one of the main accusers during the Salem Witch Trials, not much is known about Abigail Williams before or even after the trials ended. What historians do know is that Abigail Williams was born on July 12, 1680. At the time of the Salem Witch Trials, Abigail was living with her uncle, Reverend Samuel Parris, his daughter Betty Parris and Parris’ slaves Tituba and John Indian. It is not known why Abigail was living with the Parris family but many historians assume her parents had died. William’s troubles began in the winter of 1691/2, when some of the afflicted girls were reportedly experimenting with fortune-telling techniques, specifically a technique known as the “venus-glass” during which the girls dropped egg whites into a glass of water and interpreted whatever shapes or symbols appeared in an attempt to learn more about their future husbands. According to the book A Modest Enquiry Into the Nature of Witchcraft by local minister, Reverend John Hale, on one of these occasions the girls became terrified when they saw the shape of a coffin in the glass. Shortly after the incident, in January of 1692, Betty Parris and Abigail Williams began behaving strangely, having fits, screaming out in pain and complaining that invisible spirits were pinching them. Ann Putnam, Jr., and the other afflicted girls soon started experiencing the same symptoms. Just a few days after the witch cake incident, the afflicted girls named three women they believed were bewitching them: Tituba, Sarah Good and Sarah Osbourne. The women were arrested and examined on March 1, 1692. During Tituba’s examination she confessed that she was a witch and warned the court that there were other witches in Salem. This confession confirmed the colonist’s greatest fears that the Devil had invaded the colony and sparked a mass hysteria and a massive witch hunt in Salem. After news of the witch hunt spread throughout the colony, Reverend Deodat Lawson, the previous Salem minister, returned to Salem in mid-March to find out more about the suspicious activities in the village. The following day, Sunday, March 20, Abigail Williams disrupted services in the Salem Village meetinghouse several times due to the presence of accused witch Martha Corey. Corey had been accused of witchcraft the previous week and a warrant had been issued for her arrest on Saturday, March 19. Also according to Lawson’s account, On March 31, the colonists held a public fast due to the suspicious activities in the village, during which Abigail Williams claimed she saw witches having a sacrament that day at a house in the village. Abigail said she saw the witches eating and drinking flesh and blood, which appeared as red bread and a red drink. Q. Abigail Williams! did you see a company at Mr. Parris’s house eat and drink? A. Yes Sir, that was their sacrament. A. About forty, and Goody Cloyse and Goody Good were their deacons. A. They said it was our blood, and they had it twice that day. It was during this examination that Abigail Williams and the other afflicted girls turned on John Proctor and accused him of witchcraft as well. It is not known why exactly the girls accused John Proctor but it is suspected that it was because Proctor was an outspoken critic of the girls, often calling them liars, and reportedly stated they should be whipped for lying. In Arthur Miller’s 1953 play, the Crucible, in which Abigail Williams makes an appearance as a major character, Williams is portrayed as having an affair with John Proctor and accuses Elizabeth Proctor of witchcraft so she can marry John herself after Elizabeth is executed. It is unlikely that this actually happened due to the age difference between the eleven-year-old Abigail Williams and the 60-year-old John Proctor at the time. There is also no proof that Williams and Proctor even knew each other before the witch trails began. 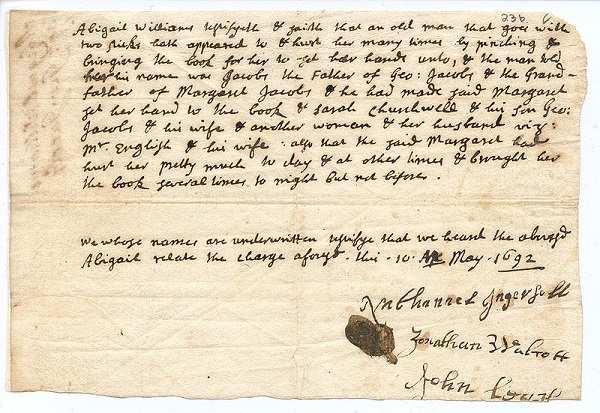 Even though Abigail Williams accused many victims at the beginning of the trials, especially in March, April, and May, she only testified against eight of them: Mary Easty, George Jacobs Sr, Susannah Martin, Rebecca Nurse, John Proctor, Elizabeth Proctor, Mary Witheridge and John Willard and gave her last testimony on June 3, 1692. After that date, Williams disappears from the court hearings, for reasons unknown. It is possible her uncle, Reverend Samuel Parris, sent her away to prevent her from further participating in the witch trials, just like he sent his daughter away, but there is no evidence of this. Of the people Williams accused and/or testified against, 15 were executed, one was tortured to death and the others either died in jail, were pardoned, were found not guilty, escaped jail or evaded arrest all together. After the witch trials ended, several members of Reverend Samuel Parris’ congregation fought for years to have Parris dismissed from the church due to his role in the Salem Witch Trials. His dissenters submitted a list of problems they had with Parris, which included a number of issues that were directly related to Williams and the afflicted girls. In November of 1694, Parris responded to these claims by writing an essay, titled Meditations for Peace, in which he stated that God tried to teach him a lesson by allowing the witch hunt to begin in his family. The essay also states that the fact that some people in his household were accusers (Abigail Williams and Betty Parris) and the accused (Tituba) in the Salem Witch Trials was also a personal reprimand from God. These acknowledgments did nothing to help Parris or his cause. In 1697, Parris’ dissenters won and Parris was dismissed from his job as minister of the church. He left Salem Village shortly after, taking Betty Parris and, most likely, Abigail Williams with him. Neither Abigail Williams or Betty Parris ever apologized for their roles in the Salem Witch Trials. Ann Putnam, Jr., was the only afflicted girl who did when she submitted a written apology to the church in Salem Village in 1706. Although Betty Parris later married and raised a family in Sudbury, Mass, there are no records indicating what happened to Abigail Williams after the Salem Witch Trials ended. Yet, there is no proof of this though and this particular claim seems to be a vague reference to an anonymous afflicted girl mentioned in Reverend John Hale’s book A Modest Inquiry Into the Nature of Witchcraft. In Hale’s book, published in 1697, he mentions an anonymous afflicted girl who suffered from “diabolical manifestation” until her death and died a single woman. Since only three of the girls, Abigail Williams, Elizabeth Hubbard and Mary Warren, are unaccounted for in the records at the time, it is possible Hale was referring to Williams. The location of Abigail Williams’ grave is unknown. The site of the Salem Village Parsonage, where Abigail Williams lived at the time of the Salem Witch Trials, was excavated in 1970 and is open to visitors. Address: Near corner of Hobart and Forest Street, Danvers, Mass. Historical marker on site. Hill, Francis. The Salem Witch Trials Reader. DaCapo Press, 2009. Fowler, Samuel Page. An Account of the Life, Character, & C., of the Rev. Samuel Parris of Salem Village. William Ives and George W. Pease, 1857. Mather, Cotton. The Wonders of the Invisible World: Being an Account of the Tryals of Several Witches Lately Executed in New-England. John Dunton, 1692. Lawson, Deodat. A Brief and True Narrative of Some Remarkable Passages Relating to Sundry Persons Afflicted by Witchcraft, at Salem Village; Which happened from the Nineteenth of March, to the Fifth of April, 1692. Benjamin Harris, 1692. Here for some time now I have been having really weird dreams of me being able to blow things up with just a point of a finger or fly the other night when I was sleeping in my dream I saw a black cat who was talking to me the voice claim to be Abigail williams she stated she was my great Aunt I went onto asking her why I had been having these dreams and she stated because it was your destiny ever since then this cat has been in every dream I have had for the last 4 months and it follows me everywhere last night I dreamed I was in salem and was standing in front of a cottage the cat told me to go in at that moment I got scared and woke up.. Can anyone tell me whats going on and why this cat is always in my dreams. wait, wha? so have you ever seen a cat like that one or read the crucible recently? No I have not watched the crucible. No I have not seen a cat like that one in my life but it’s always in my dreams guiding me and talking to me the dreams get more intense and are still growing my goal is to just go to Salem and find out what happens. Fascinating reading all this information. Wish we could find out exactly what happened to Abigail. I’d love to be able to visit some of the historical sites, hopefully one day, as I am from Newcastle, UK. Can’t wait to learn more about the Salem Witch Trials. Thanks for the kind words, Sigourney! I also wish we could find out what happened to Abigail and the many other people involved in the trials. It’s like many of them just vanished into thin air after the trials ended. I hope you get to visit Salem someday because it’s a fascinating place! I found this article about Abigail Williams very informative. I am looking forward to learning more about this subject and also, hope to find out more about the infamous Salem Witch Trials! I have come to learn that Ann Putnam Jr is a great Aunt of mine down my family tree and somehow Abigail Williams is also listed in my family tree. Could this be why I have dreams of being a Warlock going to a witch academy and having weird feelings at night. I some times wonder I have always been drawn to Salem like someone is reaching out to me and I know one day I will find out. Wow! Very informative! Thank you. Does anyone have an idea of what any of the afflicted girls may have looked like? There had to be paintings or something. No there were definitely no paintings. Artists didn’t paint villagers and farmers. They painted aristocrats, public officials, clergymen, and other “notable” figures. It’s a shame. You could get a vague idea of what they looked like by tracing their family’s heritage. That early on in the USA the population was much more homogenous than it is today, and so depending on where the Europeans who settled in Mass. were originally from, you could paint a fairly clear picture of what they probably looked like as far as skin tone, hair colour, eye colour, height etc.